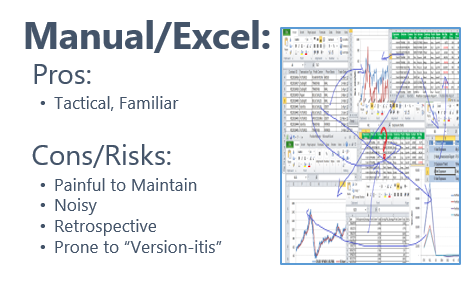 The resulting "Excel hell" can quickly become a counter-force to controlling outcomes and valuation. Version entropy, unreliable data, and extraneous information can produce more overhead than insight. At best, a reliance on Excel delivers fragmented, retrospective snapshots into a company's performance. Why then, do companies refuse to give up the crutch (i.e., Mistake #1)? Two reasons: Excel is familiar, and the alternative is daunting. So, what's the alternative? A data warehouse. Yet most "progressive" companies opt for Mistake #2. Overwhelmed by the specter of deploying a data warehouse, and lured by marketing from BI vendors who tout data connectors that simplify extracting data from disparate systems, companies are apt to jump from the Excel frying pan to the "mash-up" fire. While data connectors in leading BI tools such as Tableau, Cognos, and Power BI do provide a quick way to access data and prototype reports, the resulting mash-up systems scale poorly and deliver limited functionality, creating "technical debt" (see "Do I Really Need a Data Warehouse" for a deeper dive on this topic). Shortcuts become long-cuts. You want the ease of Excel with the automation of a mash-up tool, but you need the scalability of a data warehouse (without all the overhead). The modern data-warehouse-as-a-service makes that possible in short order and at a comparatively nominal cost. Standing up a SQL data warehouse in-house (with the requisite licensing, backup, disaster recovery, administration, and maintenance) requires a large capital investment and weeks or months to deploy. On Azure, the same can be done in days as a variable expense. The result is a cost-effective, tightly integrated system of built-for-purpose tools that are durable and flexible when it comes to scaling, validating data, adding new data sources, and dealing with almost any curve ball you can think of. Mash-up systems and Excel, by contrast, are less flexible and far more apt to break when changes occur. Set your data system up right, and you'll have the foundation for maintaining clear, real-time visibility into performance throughout your organization. Data intelligence is the key to controlling outcomes, and to demonstrating that control is key to defending valuation. To learn the most efficient and effective means of becoming a data-driven company, download the first two chapters of our book, The Dashboard Effect. Send us your comments and we'll ship you a hard copy from Amazon. Questions? Contact Jon Thompson, Blue Margin Sr. Partner at jon.thompson@bluemargin.com or at (970) 214-1652.